January of 1870 was a bad time for my family. On a Saturday night late in that month, David Coleman, a 72 year-old planter who had fought with Old Hickory at New Orleans at age 16, was gunned down on his front porch. He had not sold any cotton from his five square mile farm since the war, but had continued to raise it; that winter he finally carried his cotton to Memphis and sold it. He received a fair sum of money for it too – “a water pail and nail keg” full of gold and silver, as my grandfather told me, however much that was. People guessed that Colonel Coleman had just come into a great sum of money. So two carpetbaggers enlisted five ex-slaves to dress up as Klansmen and rob the old man. They rode up to the gate, called him to the door, and demanded his money. When he retreated, he was shot through the door, pierced by three balls. The front door still had bullet holes in it when the house was torn down in the early ‘60s. A loyal servant ran off to fetch Coleman’s sons as he lay bleeding on the floor. When the sons arrived, the thieves were tearing apart the house looking for the money. They fled, but not before the sons seized two horses. The horses led to the arrest of the five murderers the next night and they quickly confessed, also implicating the two carpetbaggers. The white ringleaders fled the county, but the five assailants were taken to the county jail. On Monday the old man died. On Tuesday, his two sons, both Confederate veterans, showed up at the jail “at the head of a considerable party of their neighbors”, this “party of neighbors” being substantially identical to the survivors of the Fifth Tennessee Regiment of Infantry. The story is that the detachment of Yankee cavalry garrisoning the place decided this would be a good night to see what was going on at the other end of town. In my family, if you kill us, we will kill you back. Alas, the water pail and nail keg full of gold and silver coins are still hidden on the property somewhere. Reading between the lines, there is a lot of information in this messed-up little story. There is a strong hint that there is not much law and order in the South following the Civil War. Carpetbaggers have gangs of ex-slaves riding around robbing and killing, pretending to be Klansmen – and getting away with it for years. 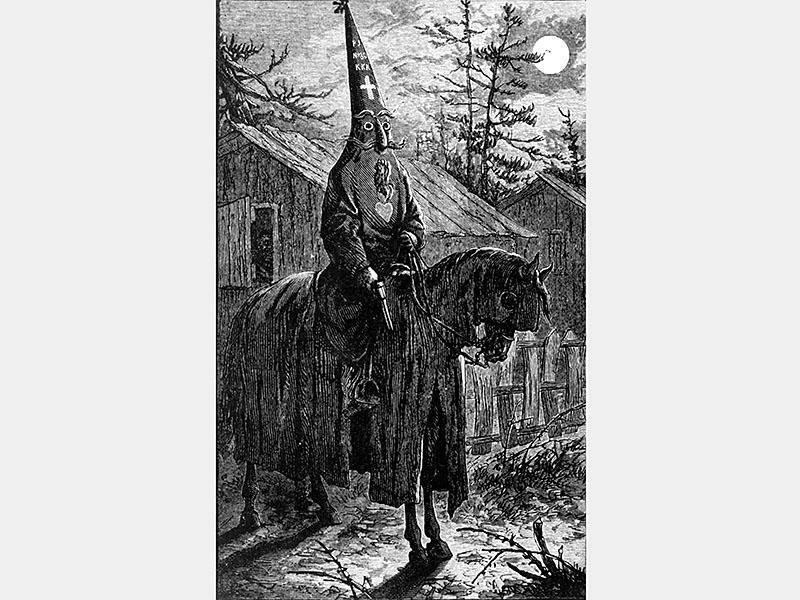 Then there were the genuine Klansmen, not exactly known for operating within the law. The Confederate veterans give us a feeling for the potential of the “unorganized militia” in enforcing justice in lawless times. There was no effort by my ancestor or his neighbors to conceal their identity – God help anyone who dared to make an arrest out of this vigilante affair. The Yankee cavalry, once past the introductory “we were sent by the government and we are here to help you”, proved useless. Put aside any notion that the Civil War ended at Appomattox. That is simply the point where the country became exhausted by the mass casualties from organized armies and shifted into a long and bitter guerilla fight which was still very much a “civil war.” Jim Webb, in Born Fighting, quotes historian Wilbur Cash on this subject: “Reconstruction was, for our purposes, simply an extension of the War … During those thirty years, the South was like nothing so much as a veteran army.” Rights of citizenship were denied former Confederates, who could not vote, sit on juries, hold public office or even get married without taking the oath of allegiance. Conversely, their former slaves suddenly had all of these rights. Meanwhile, carpetbaggers came south to steal land, homes and businesses for “back taxes.” All the vanquished had left was their pride – and guns. This helps account for the lynching of my ancestor’s murders: there could be no fair trial because only ex-slaves and Yankee sympathizers could sit on juries. While the occupiers ruled by day, Confederate veterans owned the night. The first Ku Klux Klan arose in the late 1860s as an insurgent movement pushing back against the newly freed blacks and their white Republican allies. The Klan employed the same tactics as the Viet Cong – terror and assassination of political opponents – and had some measure of success until about 1870, when the Federal government appreciated the scope of the threat and cracked down. If one wishes to step into a time machine for a glimpse of how white southerners viewed the first Klan, watch D.W. Griffith’s Birth of a Nation, https://archive.org/details/dw_griffith_birth_of_a_nation. Spoiler alert: the Klansmen are the good guys. Progressive hero Woodrow Wilson praised the film: “It is like writing history with lightning, and my regret is that is all so terribly true” (which tells you something about the original Progressives). The black population was not excited about being terrorized by the Klan and formed competing militias. And they did fight each other. The worst peacetime massacre of the 19th century occurred in Colfax Louisiana in 1873. William Ward, a freed slave from Virginia commanding the state militia, took over the county courthouse to secure a contested election that the Republicans may have lost. White leaders responded with terror directed against the black residents, driving them into town under protection of the state militia. The Klan descended on Colfax that night; Ward fled to recruit reinforcements. The Klansmen, many undoubtedly Confederate veterans, made short work of the state militia, killing about 100. An additional 40 blacks were captured and executed that night in a cotton field. Nine attackers were arrested; three were convicted. On appeal to the United States Supreme Court in U.S. v. Cruikshank, all convictions were reversed since the anti-Klan laws only applied to states and not individuals. Cruikshank also held that the states have the right to decide who can keep and bear arms, which opened the door to gun control banning black ownership of firearms. Black militiamen parading in South Carolina on the July 4th centennial irritated two white boys, one of whose daddy complained to the local judge that the parade obstructed a public avenue. The judge ordered a hearing. On the day of the hearing, over a thousand armed whites showed up to confront about 100 black militiamen holed up in the town armory. The whites riddled the building with bullets and then knocked it apart with cannon. It was a massacre. In the 1876 election in South Carolina, Confederate cavalryman Wade Hampton had his Redshirts – some of whom were black – who were dedicated to ending Reconstruction and reestablishing home rule in South Carolina. Hampton had a major Red Shirt constituency among the gun clubs. They scattered Republican rallies with gunshots, threatened candidates and in some cases assassinated Republicans. The Democrat tradition of election fraud has old roots and Hampton won handily, with more votes than voters being cast in some districts. The Republicans were expelled and Reconstruction was effectively over in that state. Did the war end at Appomattox? The James gang, who had been fighting a guerilla war under Quantrill, was still living that lifestyle when they were shot to pieces robbing Northfield Minnesota in 1876. For African-Americans, Jim Crow did not end until the 1960s. By some accounting, it has not yet ended as minimum wage and Davis-Bacon are Jim Crow laws expressly created by white union leaders to exclude blacks from labor markets. For Southerners and Americans in general, we are still struggling to return power to the people and the states. And our northern neighbors are still trying to tell us how to think. Maybe the war is not over at all?